Sushila Vittal Sabale has been a waste picker for nearly 30 years. She has a lot of experience in the field of wastepicking (also called rag-picking) and knows the importance of waste management, she says. She believes that it’s important that she, other wastepickers, and PBVS (the wastepickers’ organization she works with), help reduce global warming. Sushila is also involved with gardening and composting projects. 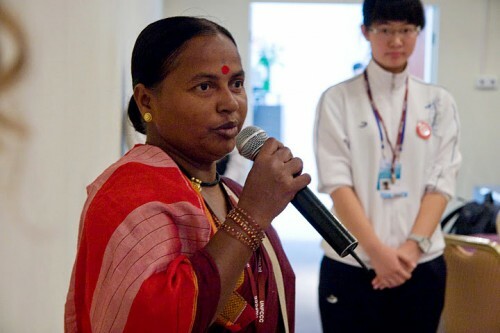 Sushila, a member of the Global Alliance of Wastepickers, participated at COP17 as the official representative for the Mary Robinson Climate Justice Network as well as she attended as a representative of the Indian Alliance of Wastepickers. Sushila encourages her peers to join the association so they can receive its benefits and upgrade themselves and their families.